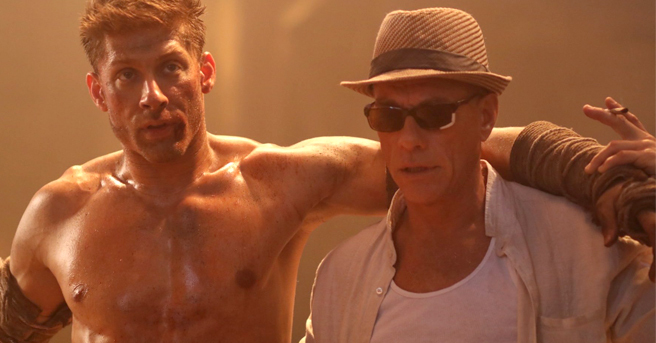 The 2016 reboot KICKBOXER: VENGEANCE pulled a CREED by putting Jean-Claude Van Damme, the star of 1989's KICKBOXER, into the mentor role (though not as the same character) while Alain Moussi inherited lead KICKBOXER duties. It was an enjoyable enough actioner that had some good fight sequences and a lot of genuine affection for Van Damme, with Moussi even recreating JCVD's goofy dance from the original. But it was a troubled production that dealt with the death of co-star Darren Shahlavi early in the shoot, then had filming suspended for four months when production company Radar Pictures left the New Orleans portion of the shoot without paying the crew and locally hired personnel. Director John Stockwell then quit and when production resumed in Thailand, co-writer Dimitri Logothetis (SLAUGHTERHOUSE ROCK) took over directing duties, though only Stockwell was credited. 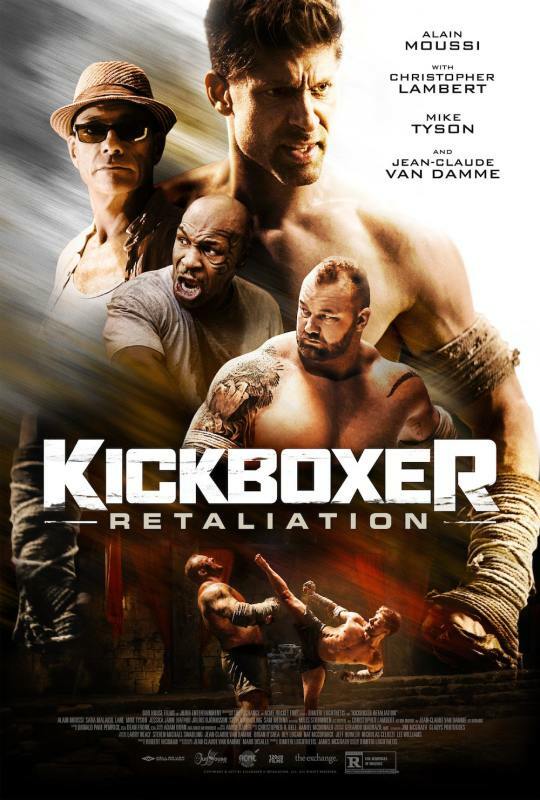 Logothetis is back to direct KICKBOXER: RETALIATION, and while it seems to have been blessed with a more stable production, it lacks the sentimental charm and the financial backing of its predecessor. Stockwell is no auteur, but he's got A-list experience and has directed a number of nice-looking movies like BLUE CRUSH and TURISTAS. Logothetis has logged more time producing than directing and doesn't have the kind of eye that Stockwell has, and as a result, KICKBOXER: RETALIATION looks drab and cheap, with one scene on top of a speeding train that shows off some of the most laughably bush-league greenscreen that the mid-1990s had to offer. Originally intended to be released last year, KICKBOXER: RETALIATION was shot quickly and was already in the can when KICKBOXER: VENGEANCE bowed, and it shows. It's perfectly watchable but utterly average and it looks like the very definition of "straight-to-DVD." Moussi is back as Kurt Sloane and he's introduced winning an MMA bout in Vegas, after which he's confronted by federal agents wishing to question him in connection to the death of Tong Po (Dave Bautista in VENGEANCE), the Muay Thai champion who killed Kurt's brother (Shahlavi) in Thailand. Of course, Kurt killed Tong Po (hence, VENGEANCE), and of course the agents are impostors, tazing Kurt and taking him back to Bangkok. He's thrown in a jail run by evil fight promoter Thomas Tang More (Christopher Lambert sighting! ), who's understandably pissed that Kurt killed his top fighter and demands revenge. He wants Kurt to fight Mongkut (Hafpor Julius Bjornsson, best known as "The Mountain" on GAME OF THRONES), an undefeated, roid-raging giant and state-of-the-art killing machine who's enhanced by regular adrenaline injections and spends his downtime strumming an acoustic guitar. More is prepared to let Kurt rot in jail until he agrees to fight, which he finally does when More's goons kidnap Kurt's wife, former Bangkok cop Liu (Sara Malakul Lane), after she arrives to find him. Kurt preps for the showdown with the help of the other Muay Thai fighter inmates, including Briggs (Mike Tyson), who tells him "I keep my fist fast and hard, ready to break anything that it hits." Additional guidance and training comes in the form of Kurt's old mentor Master Durand (Van Damme), who's also been imprisoned--and blinded--by More. Veteran stuntman Moussi isn't much of an actor but he's pretty good in the action sequences, and Logothetis pulls off a couple of reasonably well-executed single-take throwdowns in the vein of the OLDBOY hallway fight. 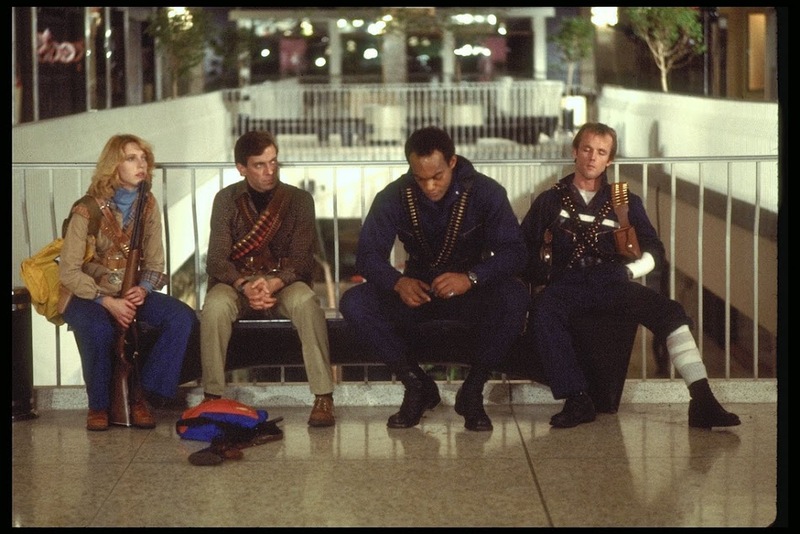 Tyson pretty much sits out the second half of the movie and has little to do, and Van Damme is pretty subdued throughout, going for the "old and wise" act with the now-blind Durand. There is one nice bit where Durand gets his Zatoichi on during a sword fight with More, and Bjornsson's Mongkut is a truly imposing villain. The best part of KICKBOXER: RETALIATION is the enthusiastically hammy performance of Lambert, who's got a gravelly-voiced Nick Nolte thing going on and appears to be having a lot more fun than everyone else. 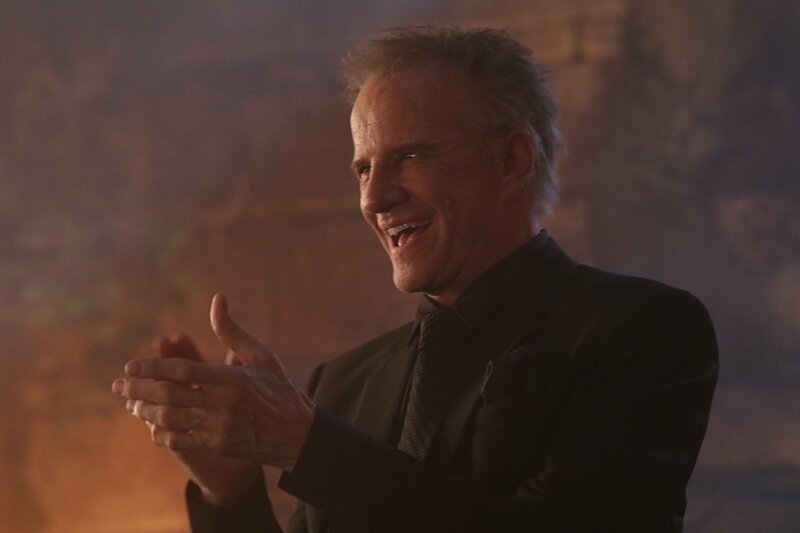 He seems fully aware of how dumb this movie is and there's occasionally some bit of inspired dialogue where Logothetis uses Lambert to comment on the genre cliches (the way More tells Kurt "It's time to defend your title...in another fight to the death! "; and when Liu is kidnapped, Kurt sternly warns More "If anybody hurts her..." as More cuts him off with a derisive, eye-rolling "I know! We all die! "), and More joins the long list of evil martial arts tournament masters who, for some reason, have a random hall of mirrors on the premises, this one inexplicably blacklit. Who is More anyway? We know he's a fight promoter, but when Liu arrives in Bangkok and asks her special agent friend Gamon (Jessica Jann) for info, the only intel she can offer is "I know he's got more money than God!" Is he a promoter? A crime boss? A warden? He seems to be running the prison, and somehow lets Kurt, Durand, and others come and go as they please. And how is everyone in this prison a master of Muay Thai? Wouldn't some of them be well-known? Wouldn't there be an investigation if a bunch of Muay Thai dudes from all over the world went missing and were being held in an off-the-grid Bangkok prison run by a corrupt fight promoter? And these tournaments are always jam-packed with people. Certainly someone would blab at some point, right? Throw in a ludicrous, adrenaline-based deus ex machina straight out of PULP FICTION, and KICKBOXER: RETALIATION sounds like goofy fun, but at some point, it stops winking at the cliches and just starts embracing them. At 110 minutes, it's way too long, the final fight is drawn out to around 30 minutes of screen time and grows repetitive, and the funny lines eventually become groaners (Kurt to Mongkut: "The only way I'm going down is if you ugly me to death!"). In the end, it's a routine kickboxing movie with little to differentiate from all the BLOODSPORT and KICKBOXER knockoffs that flooded video stores in the early '90s, but an engaged, spirited Lambert provides a spark whenever he's onscreen ("DO SOMETHING!" he frantically yells when Kurt gets the edge on Mongkut). If you're a fan of Lambert, he single-handedly makes this worth seeing, even if Logothetis completely drops the ball by not having More begin the fight-to-the-death showdown by announcing "There can be only one!"